India is well-known for its power problems. According to the Central Electricity Authority (CEA), India’s energy shortage was 8.5% and its peak shortfall was 9.8% in the fiscal year 2010-2011. This situation is expected to deteriorate further. According to a study by McKinsey, the power deficit in India could be as high as 25% by 2017. Cooling and air conditioning is one of most energy intensive processes amongst the energy consuming applications. Some estimates suggest that HVAC (Heating, Ventilation, and Air Conditioning) networks are to blame for over 30% of a building energy usage. When put in context of millions (number of Indian homes and businesses installing air conditioning every year), the enormity of the supply and application gives a relevant perspective on electricity demand and consumption. The drastic increase in electricity demand on hot summer days not only causes a large increase in the use of fossil and nuclear energy, but also threatens the stability of electricity grids. According to a study by World Bank, one-third of Indian businesses cite expensive and unreliable power as one of their main business constraints. Thus, any technology that can help to save energy in the cooling and air-conditioning applications can help to reduce India’s power shortage burden to a great extent and build the economy as well. Fortunately, there is an alternative to electricity to cool offices, plants and factories. No points for guessing. The answer is absorption cooling through Concentrated Solar Thermal (CST) technologies. The traditional compressor driven cooling and air-conditioning systems are known to be energy guzzlers. Absorption cooling is a promising alternative for these traditional compressor-driven systems that are widely prevalent today. The absorption cooling systems are driven by heat, unlike the traditional compressor driven systems which run on electricity. The operating principle of the absorption cooling is explained below. A thermal compression of the refrigerant is achieved by using a liquid refrigerant/sorbent solution and a heat source, thereby replacing the electric power consumption of a mechanical compressor. For chilled water above 0°C, as is used in air conditioning, a liquid H2O/LiBr solution is typically applied with water as a refrigerant. Most systems use an internal solution pump, but consume only little electric power. In the operation of an H2O/LiBr absorption chiller, a crystallization of the solution has to be avoided by internal control of the heat rejection temperature in the machine. The main components of an absorption chiller are shown in the figure below. The cooling effect is based on the evaporation of the refrigerant (water) in the evaporator at very low pressure. The vaporized refrigerant is absorbed in the absorber, thereby diluting the H2O/LiBr solution. To make the absorption process efficient, the process has to be cooled. The solution is continuously pumped into the generator, where the regeneration of the solution is achieved by applying driving heat (e.g. hot water). The refrigerant leaves the generator by this process, condenses through the application of cooling water in the condenser, and circulating by means of an expansion valve again into the evaporator. Typical chilling capacities of absorption chillers are several hundred TR. They are generally supplied with waste heat or heat from co-generation. The required heat source temperature is usually above 80°C for single-effect machines and the COP is in the range of 0.6 to 0.8. Double-effect machines with two generator stages require driving temperatures of above 140°C, but the COPs may achieve values up to 1.2. A few absorption chillers with capacities below 50 TR are also now available. 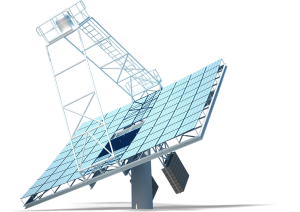 In solar cooling systems, solar heat is used to drive the cooling process. Thermally driven cooling machines, such as absorption chillers have been used for decades, but have been powered mainly by industrial waste heat. In recent years, demonstration projects have shown the potential to use solar thermal energy to drive those chillers. Because most of the available thermal chillers have large cooling capacities, the focus of R&D has largely been on developing smaller cooling units as well as to improve the system design. Lack of chilling units with small capacities. These issues are being addressed by the joint effort of the industry and government policies to promote the use of solar assisted cooling systems, which could have a huge impact on India’s energy scenario. The first solar cooling system assisted by ARUN solar boiler has been installed at the office building of Turbo Energy Limited (TEL), Paiyanoor, about an hour’s drive from Chennai. TEL is a leading supplier of turbochargers to many Original Equipment Manufacturer (OEMs) operating in India. The company has undertaken various green initiatives & has been the first certified auto ancillary company under ‘PLATINUM’ category by LEED USGBC (United States Green Building Council). Cooling loads generally have a high coincidence with the availability of solar irradiation. 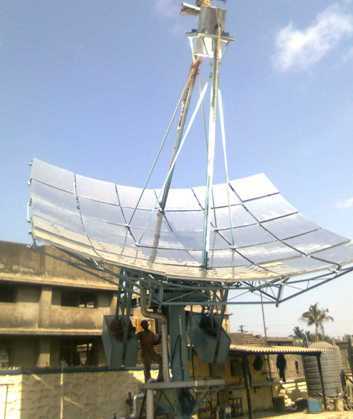 In a country like India where solar energy is available in most parts of the country and power shortfall is very common, the combination of using concentrated solar thermal(CST) and VAM for cooling has a high potential to replace conventional cooling machines that operate on electricity. Solar thermal concentrating technologies like Clique Solar’s ARUN solar boiler can achieve high temperatures, thus allowing the use of multiple effect VAMs which can reach higher COPs. The actual data of fuel savings by Clique Solar’s ARUN Solar boiler system installed at TEL,Chennai is an excellent example of solar cooling and an inspiration for others to use solar for cooling.